Gemina is told in an outstanding layout. The series does not have as many narrations as others, yet the layout makes up for all the lost. Hanna’s journal, surveillance cameras, chat rooms, surprise third character’s point of view (my favorite!) and many other elements built an epic tale of bravery that not only lures readers to read but also live alongside the characters. Also, we get to see Marie Lu’s awesome scribbles so it’s all great. Five-star character development. Unlike its predecessor, Gemina features a deeper insight to our main protagonist through her personal journal. The journal helps readers to see and feel the impact of the too-sudden predicament as experienced first hand by Hanna Donnely. We can clearly see how Hanna go from a seemingly spoiled girl who draws scribbles about her daily life and occasional cute boys to a startlingly brave and intelligent young woman. Hanna is, by nature, a cunning girl who gets whatever she wants, military leader daddy or not. Combined with a deadly alien attack, and apparently having the weight of whatever humanity left on her shoulders, she blossomed into an admirable heroine you can’t help but love. Other than Hanna, we’ll also meet Nik Malikov, a misunderstood young man who is both a drug dealer and the sweetest, most caring boy ever. At first glance, he is the average bad boy, but then you must not judge a book by its cover, right? Heart-wrenching epiphany. Really. If I got a penny for everytime my heart skip a beat, I’d probably have a brand new car. The moment when everything snaps into place is the best feeling you could ever achieve as a reader. The title will make perfect sense once you read the book. I was too stunned and had no proper reaction. Should I cry? Should I be relieved? Should I throw the book to the wall? I won’t spoil anything, so please just read it. The plot twist is perfect. AIDAN. Enough said. Judging by the word on the cover, you know AIDAN is back. There is something incredibly fascinating about reading words which are told by a supposedly unfeeling program, yet the moments are captured perfectly, feelings and emotions and all. AIDAN is still a twisted artificial intelligent with dubious morality—or the lack thereof—but it (he? She? They? You decide) will help us to experience every single madness and actions, in which feelings will undoubtedly destroy everything. You’ll see AIDAN in a brand new light, and its point of view is simply the best. After all, we'd be lost without our psychotic AI. Sweet romance. I, a fan of romance, was satisfied. The amount of romance is proportional, considering the main genre of this book. What I love the most about Hanna and Nik is that they are not only a girl and a boy who find each other in the middle of chaos, but two human beings with scars and responsibilities to make things right. They understand the risks perfectly and still fight even in the most impossible situation where other people would just give up and throw everything out the window. They are stronger than any other couples I’ve ever read. Things go not according to their plan here and there, yet they’ll always find each other. Now that’s sweet. People argue about which one is better between Illuminae and Gemina. I believe these two books have their own charm, and it’s completely subjective to decide which one is better. For me, I actually like Illuminae more because I got the worst chills reading it, but maybe it had something to do with me reading it at two a.m. alone. 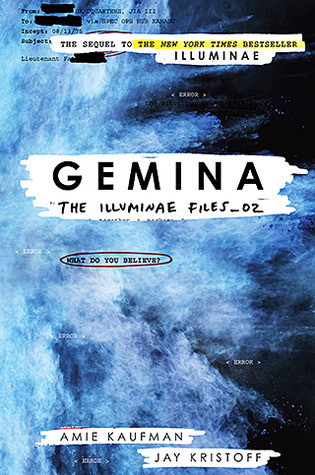 As for Gemina, the characters are more interesting and the plot is amazing. Gemina will leave you out of breath and you’ll find yourself sitting in the same spot for five minutes, contemplating everything because holy sh*t. This book is pure gold. Greatest YA I've ever read.